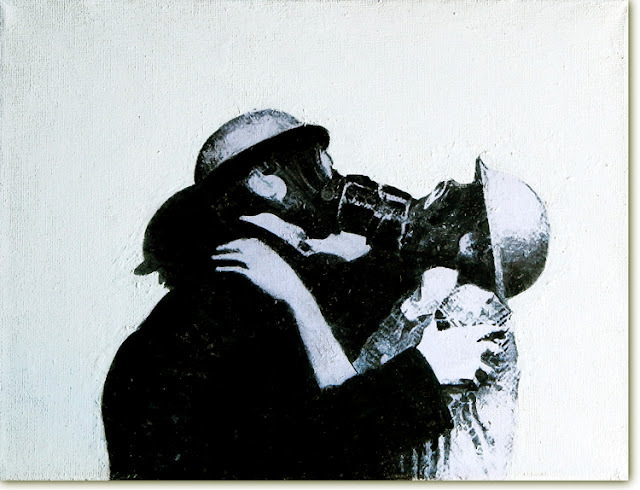 The Kiss portrayed is blocked by the gas masks of the wearers, it is as if the desires cannot be expressed as a reality but as an incomplete sensation. The Kiss is a Painting from a series of found images of gas masks. Its about 30 x 24 cm on a stretched canvas in black and white. Gustav Klimt painted his Kiss painting in 1908 only 32 years before this WW2 image was made. I find these images absorbing because of the way the gas masks are portrayed as part of a normal life.